Danielle's got style and drafts a Hudson sweater with a few surprises. She shares the ideas behind her creation and gives a few tips too. - O! Inspired by O! Jolly! 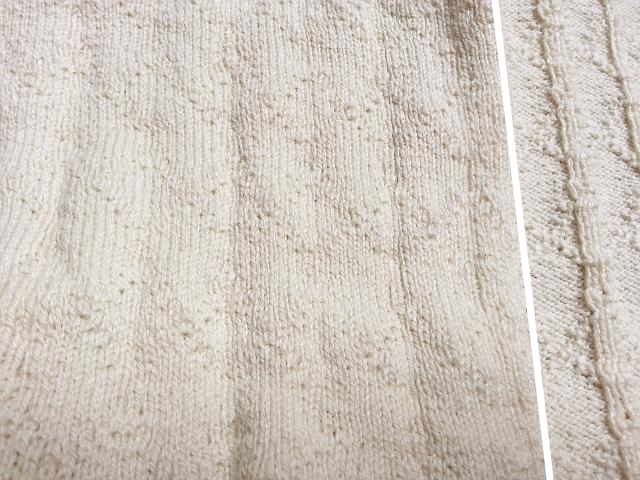 New Hudson sweater knit fabric (no longer available), I got the idea to make a sweater with a shirttail hem. The first thing I needed to do was to decide which design to actually use! I'm definitely a fan of hooded sweaters but I decided to forgo a hood for this project. Instead I went with a simple tunic length sweater with a v-neck. The stand out feature would be the shirttail hem. For this version, I decided to make it slightly longer in the back. 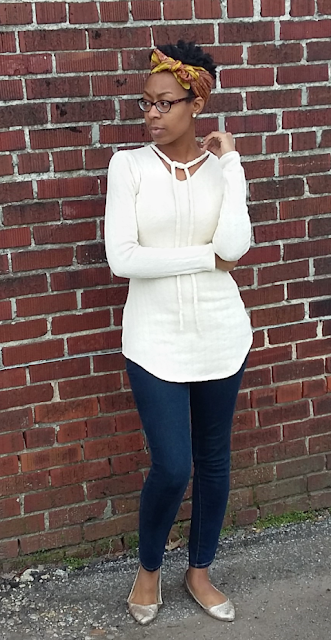 Shirttail hems on pullover shirts can be really chic. The key is getting the right curve on the bottom. In some online tutorials for a shirttail hem on a knit shirt, the results look more like a perfect, round scallop rather than a bell-shaped curve. A bell shape more closely resembles the hem of a men's dress shirt, which was my original inspiration for this sweater. My next challenge was deciding which side of the fabric to treat as the "outside". 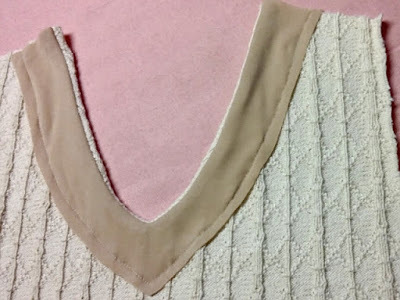 The pattern is more pronounced on one side, so that should be considered the "right" side, but it also kind of looked like the back side of a cable knit. I went out on a limb and sewed on the other, smooth side. Smooth side (on the left) was used as the "right" side for this project. Technically speaking I did not use a traditional commercial pattern for this sweater. I tend to fall in between sizes so instead I used a t-shirt that I already had as a template. My worn-in t-shirt had been stretched over time to fit my shape perfectly. After folding and laying out my t-shirt template on the sweater fabric, I marked out a rough hemline. Because I was using a standard length t-shirt, I had to add a few inches in order to make it hip length/tunic length. I added an extra 2 inches on the side and a total of 5 inches to the center front. From there I made a curved line from my 2-inch mark on the side seam to my 5-inch mark on the center front. 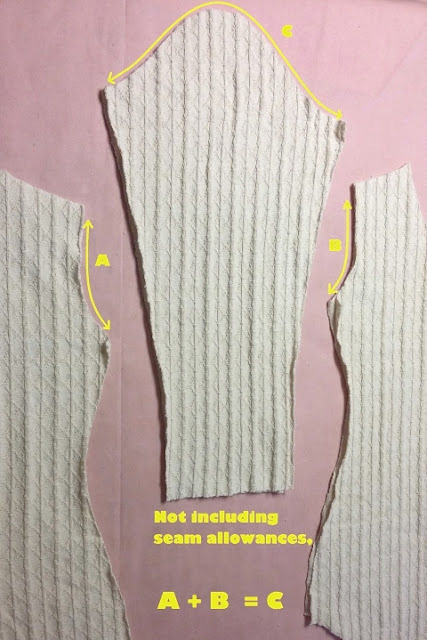 After cutting out the front piece in the sweater knit fabric I used it as a template for the back. However, because I wanted a longer length in the back, I marked the longer length with pins before cutting it. After cutting out the basic shapes -- my front, back and sleeves, I felt the the style needed something else. I cut a shallow V-neck into the front neckline and had the idea to do a tie around the neck. 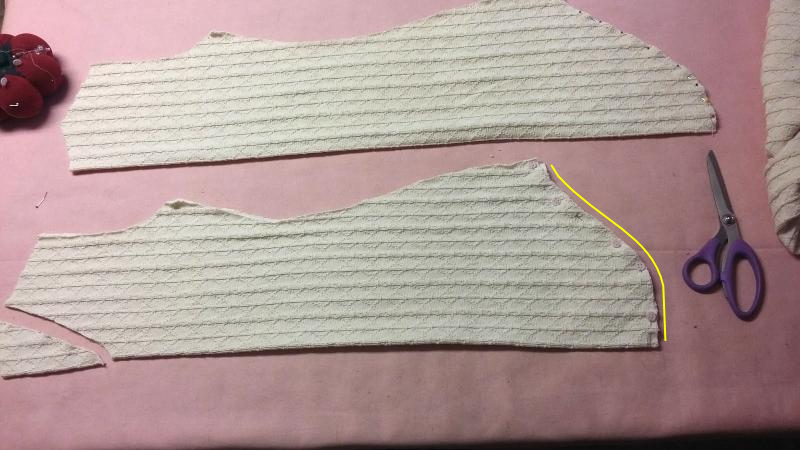 For the necktie, I simply used a narrow cut of the selvage, using the curl of the knit to my advantage. This tie is also used to finish the back neckline to bind the raw edge. I stabilized the front neckline with a facing and topstitching. The facing is a 2-way stretch fabric which provides stability and flexibility for the neckline. 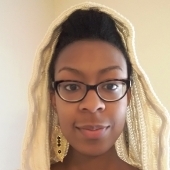 Danielle Pierce, a fashion designer from Memphis, Tennessee, is also a skilled pattern maker and technical designer. Her clothing line, Danália by DP, specializes in resort wear for women. 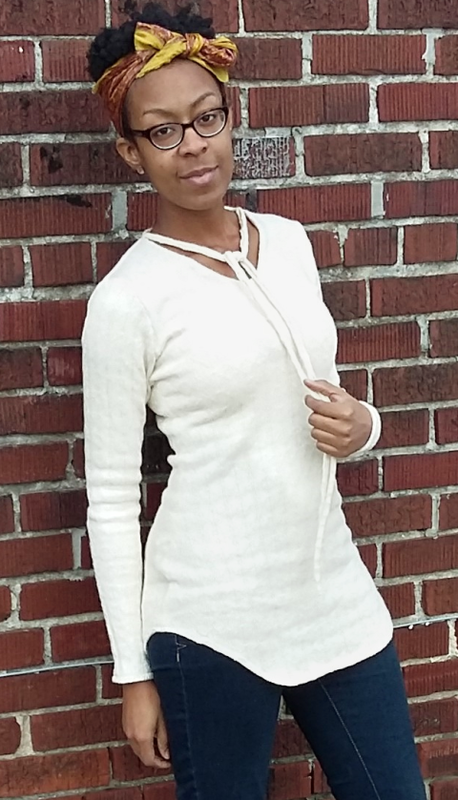 When not working on her own projects, Danielle assists other emerging fashion designers with production of their fashion lines. Danielle is currently preparing to launch her own blog and website. In the meantime, see some of Danielle's work here. Beautiful sweater and I love the idea of the ties. Thanks for the clear, detailed instructions on how to get this amazing look. Beautiful! Fits so well--simple and elegant! Thanks, everyone ! I really enjoyed making this sweater .